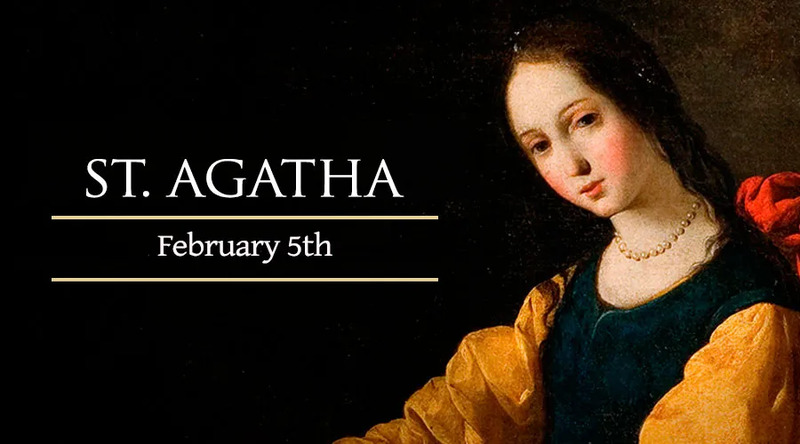 Although we have evidece that Agatha was venerated at least as far back as the sixth century, the only facts we have about her are that she was born in Sicily and died there a martyr. In the legend of her life, we are told that she belonged to a rich, important family. When she was young, she dedicated her life to God and resisted any men who wanted to marry her. One of these men, Quintian, was of a high enough rank that he felt he could force her to acquiesce. Knowing she was a Christian in a time of persecution, he had her arrested and brought before the judge - - himself. He expected her to give in to when faced with torture and possible death, but she simply affirmed her belief in God by praying: "Jesus Christ, Lord of all, you see my heart, you know my desires. Possess all that I am. I am your sheep: make me worthy to overcome the devil." When she continued to profess her faith in Jesus, Quintian had her tortured. He refused her any medical care but God gave her all the care she needed in the form of a vision of St. Peter. When she was tortured again, she died after saying a final prayer: "Lord, my Creator, you have always protected me from the cradle; you have taken me from the love of the world and given me patience to suffer. Receive my soul." Because she was asked for help during the eruption of Mount Etna she is considered a protector against the outbreak of fire. She is also considered the patroness of bellmakers for an unknown reason -- though some speculate it may have something to do with the fact that bells were used as fire alarms.